Powerful and inspiring is how one can describe ABC TV’s major new three-part documentary Don’t Stop the Music. It drew 465,000 viewers when it began screening on 11 November, and it has received high praise from all quarters, including ASME, the Australian Music Association and The Music Trust. It is obligatory viewing for all who are interested to see music built up in in Australia’s school system. Here at Music Australia we can’t praise it enough. Don’t Stop the Music tells the story of how music transforms the lives of children at Perth’s Challis Community Primary School, and it is a major step in raising public awareness about the value and importance of music education for all Australian kids. Every mum and dad should see it; and every school principal too, because the vision and efforts of Challis’s principal, Lee Musumeci, to provide music lessons to every child in her school are where the documentary started. Sadly like many other schools across Australia, this under-resourced Perth school lacked anyone on staff who could teach music. As the documentary makes known at the start, 63 per cent of primary schools in the country offer no classroom music. This alarming figure comes from the National Review of Music Education Report of 2005, which is quoted on the show’s website – also quoted there is Music Australia’s Music Is Good Fact Sheet which gives other relevant statistics. In Part 1 of the documentary, one of Challis’s classroom teachers, Simon Blanchard, is reassigned to become the new music teacher. “They saw me walking around with a guitar and they thought alright, we’ll make him the music teacher,” he says. It all takes off with his ensuing enthusiasm, and by wonderful expertise brought into the school by Guy Sebastian and Micheál McCarthy (WAAPA) as mentors. Nine months in the making, and with impressive production work by Perth-based Artemis Media which filmed the series, Don’t Stop the Music does not shy away from the hardships and frustrations that inevitably occur, both for the teachers and the kids themselves. But these make its story all the stronger. The documentary also gains notable strength from the science it presents. Dr Anita Collins, a leading authority on music’s role in the development of the young human brain, comes in as a consultant at Challis and explains how the benefits of learning music flow into cognitive and language development. Don’t Stop the Music also presents a case about how music promotes general social development, relaxation, creativity and confidence building in children. While the science is less clear and still emerging in these areas, the stories it tells about how young lives are raised by learning violin, guitar and other instruments inspire a lot of hope. Music Australia has been keenly promoting Don’t Stop the Music. It organised the Parliamentary screening last month in Canberra to politicians and interested parties, and CEO Rhonda Davidson-Irwin was on the panel at that event which discussed many issues about music education. She also the subject of a video on the music program at Pullenvale State School, Brisbane. On ABC Classic FM’s Facebook website, it tells how all 430 students there receive music lessons. It also makes inspiring viewing and reinforces the importance of play in a successful learning environment. Davidson-Irwin’s leading work on the use of games in teaching music was aired recently on ABC local radio nationally – see her accompanying article here. 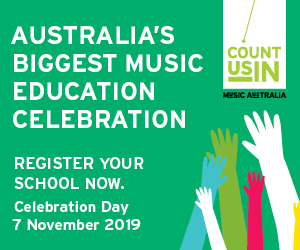 Indeed, it was Music Australia, under its former name of the Music Council of Australia, that vigorously pushed the music education agenda from the start. In 2003, under the then executive director Dr Richard Letts, it produced The Stevens Report which revealed gross deficiencies and inequities between the states in the provision of school music teaching. This then prompted the afore-mentioned National Review of Music Education Report commissioned by the Australian Government. A public campaign to donate unused instruments to needy schools coinciding with Don’t Stop the Music is underway with Musica Viva and The Salvos as partners. If you have any instrument lying around that could help a young kid begin a life in music, find out how donate here.